This may seem like the stuff a good science fiction movie is made of but it’s not. 3D Printing has come a long way. Starting out as machined you would only find in shops, 3D Printers have shrunk in size and price thanks to companies like Makerbot. While 3D printing continues to make it’s way into the home, researchers at NASA and partner companies are looking for ways to use robots and 3D printers to build buildings in Mars. Companies like SpaceX and visionaries like Elon Musk are hoping to one day inhabit Mars. While the technology to sustain life on Mars is very important, and has come a long way, next they need to handle the logistical part of this inhabitance. It takes nine months to journey to Mars, and that’s once you get out of the earth’s atmosphere. Most would imagine, that when the first colonists get to Mars they are going to want a nice warm shower and to get to work. But they’ll need shelter, labs and other buildings in place when they first arrive. With a nine month journey, ordering extra supplies for next day delivery just isn’t an option. According to IFLScience, Behrokh Khoshnevis, a NASA engineer from the University of Southern California, has been working on building robots that can 3D Print buildings by extruding concrete. He is leading the research to bring this technology to Mars. The process Kroshnevis has created is called “contour crafting”. It take enormous 3D printers and instead of extruding plastic from filament it extrudes concrete from sand. At this point Kroshnevis’ team is dealing with the fact that sand on Mars is a lot different than sand on Earth. The sand on Mars contains about 4x the amount of sulfur in it as the sand on Earth. It’s also not going through the extruders smoothly because the sand on Mars hasn’t undergone nearly as much erosion as Earth beach sand which is a lot smoother. 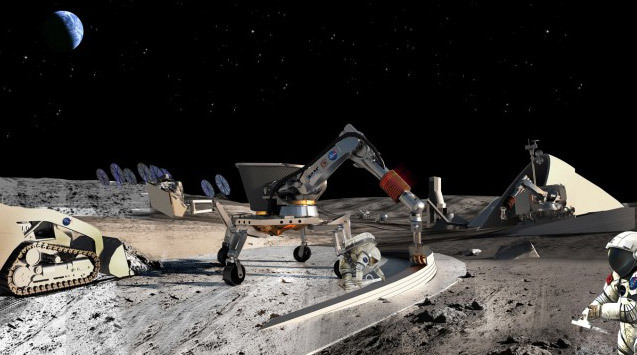 There’s no timeline as to when these robots and 3D printing processes could land on Mars. MarsOne is hoping to start voyages to Mars in 2024. SpaceX plans to be on Mars in 2026 and NASA plans to have astronauts on Mars in the mid 2030s.